When adding live mealworms to your Sugar Glider's diet, it is strongly suggested to add a 'no-phosphorus' calcium supplement to the food, such as Glider-Cal. Live mealworms are high in phosphorus which partially blocks calcium absorption, a 'no-phosphorus' calcium supplement such as Glider-Cal will compensate for the loss of absorption. Feed live mealworms as bonding treats, and as a protein supplement. Remember, mealworms are high in fat and should be limited. There are considerable differences in composition between mature and immature or larval stages of insects. 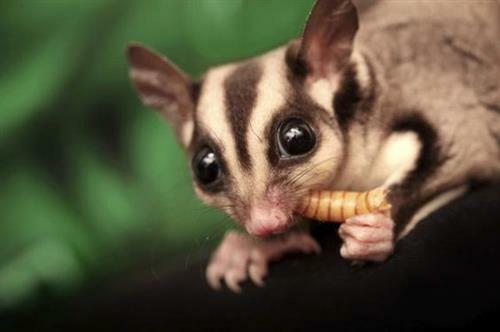 Animals (Sugar Gliders) that prey on mature insects in the wild such as moths, beetles, and crickets should not be fed large numbers of larval stage insects. Captive animals are commonly fed mealworms which are a larval stage insect. These can be poor food subsitutes for many animals because of their high fat content. Fat contains twice the energy as other nutrients and increased quantities in the diet can not only lead to obesity but significantly dilute the intake of essential nutrients. Live mealworms should be fed sparingly, they are not a substitute for a regular, balanced diet. Offer 5-10 medium size mealworms, or 3-5 Giant mealworms per week. or as a small portion (less than 10%) of the main diet. Treats may lead to health issues like obesity when overfed. If your pet is not consuming its regular balanced diet, withhold serving treats until stable eating habits resume.